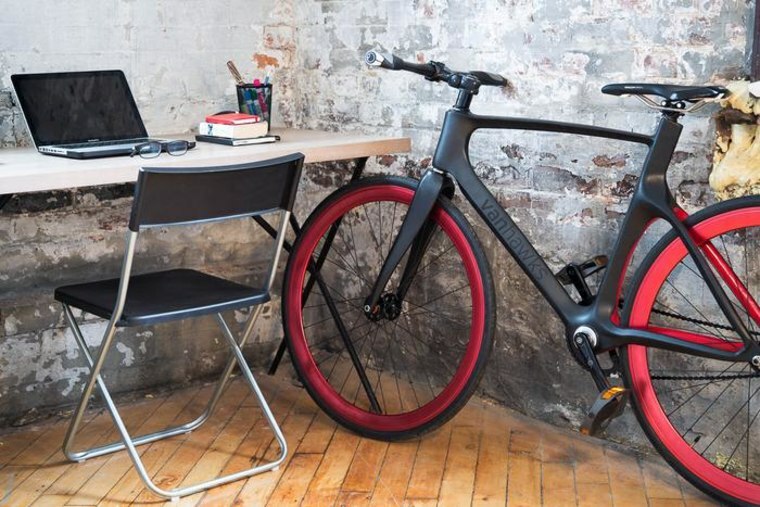 Carbon Fiber, Sonar, Wireless - Is This The Smartest Bike Ever Made? Our cars are getting smarter and smarter, so why not our bikes? With a special carbon-fiber body and built-in wireless and sonar, the Vanhawk Valour is perhaps the world's most high-tech bicycle. It even has a companion app. But you won't find it in stores — yet. The Valour is packed full of electronics, and communicates wirelessly with your smartphone to give you directions (indicated by lights on the handlebars) as well as track distance and calories burned. It also senses things like bad roads, guiding you around those next time. Wouldn't want all that tech to shake loose. There's also an ultrasonic sensor in the back that watches for things like cars and other riders entering your blind spot. When it detects something, the handlebar on the side where the object is gives a little buzz. Of course, you could just use a mirror, but where's the fun in that? You manage all these settings and data with an app, available for Android, iOS and the Pebble smartwatch. The bike itself is made from carbon fiber, which is light, strong and generally very expensive. The cheapest Valour is $1,100, so it's no cheap ride — but there are plenty of bike bodies that cost that and more. Although the version shown in the Kickstarter video is a fixed-gear, there will be a version with an internal gear hub, and the final bike will have integrated front and rear lights as well. Right now the bike is raising funds on Kickstarter for its first production run, and after a couple days is already nearing its $100,000 goal. Cautious bikers might want to wait until the Valour has been given a good once-over by some bike review experts — but of course, that would mean letting this pre-order price break ride off.